Well known Eurovision names such as Hera Björk and Friðrik Ómar are aiming to represent Iceland in Tel Aviv. The broadcaster just presented its 10 competitors for this year’s national selection, and tonight, they will reveal their songs. Local broadcaster RUV will hold a little sneak-premiere of their national selection show Söngvakeppnin 2019 tonight. The 10 acts taking part this year will be presented in tonight’s show. Following the show, the songs will also released. The broadcaster guarantee something for everyone when they introduced the songs: “Even though this year’s final competition is made up of 10 songs instead of 12, the variety and diversity are higher than ever. There’s something for almost everyone this time round”. Two semi-finals on the 9th and 16th of February will feature five acts each. A combination of public voting and an expert judging panel will select two for the final, which will be held on the 2nd of March. 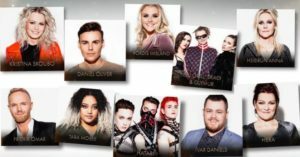 The organisers reserve the right to introduce a wild card – therefore it’s yet unknown whether or not the final will feature four or five acts competing to represent Iceland at the 2019 Eurovision Song Contest. Friday before each of the two semi-finals, a special warm up programme will be held where the participants talk about their preparations. It was back in 1986 when Iceland first appeared at the Eurovision stage. The group Icy finished 16th with the song Gleðibankinn. As a part of the group was Eiríkur Hauksson who would later go on to represent Norway in 1991 and Iceland again in 2007 – as a solo singer with the song Valentine Lost. Selma came second in 1999 with the catchy All Out Of Luck, and in 2009 Yohanna also finished as runner up performing Is It True?. Those two second places are to date the best results from the country, which are therefore yet to win the contest.